I really planned on posting Dories Herbed Olives on Friday but, after hosting Thanksgiving dinner, I was thrown totally off kilter. Then I thought French Saturday sounded good but, again I just couldn’t get it together. Here I am, and it’s Sunday! So French Sunday it is…better late than never! I started my herbed olives the beginning of the week. The deli department, at my grocery store, has a great selection of wonderful olives. I picked up some large Italian green, and some Gaeta (black) olives. Both were pretty plain with only olive oil added. I followed Dories recipe by toasting the coriander and fennel seeds, red pepper flakes, and peppercorns in a dry fry pan. After the spices cooled I added the garlic, olive oil, orange rind, rosemary and thyme to the pan and heated it. 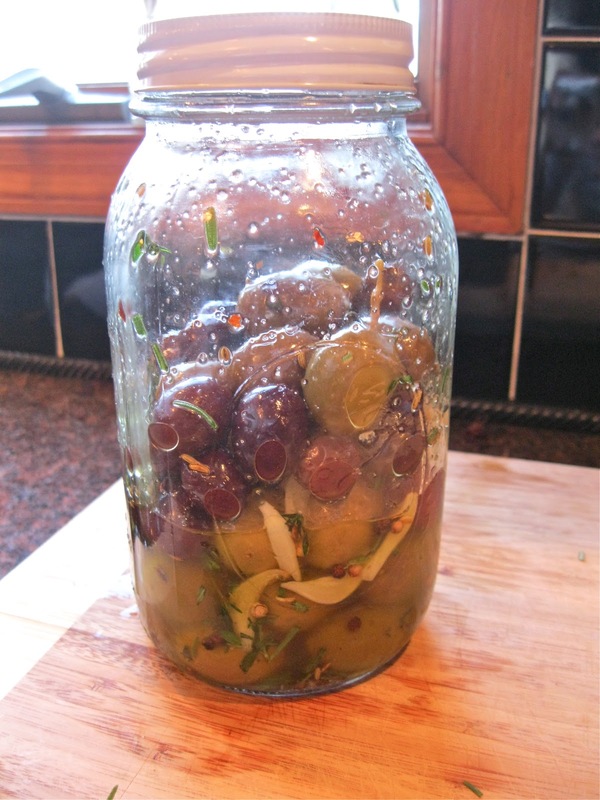 Once heated, I poured the mixture over the olives in a Mason Jar, letting them sit and macerate for at least 8 hours. These Olives were a nice addition to my appetizer table! I’m pretty sure they were a hit because, at the end of the day there were very few left in the bowl. My son, who happens to be a huge olive fan, really enjoyed these. Being of Mediterranean descent, I grew up with olives. They were always on our table. Not those canned ripe black olives that most Americans love and enjoy but, oil cured, green and kalamata. My grandmother kept a huge jar in her pantry. She served them at just about every meal. Who knew my grandmother was so far ahead of her time? Those olives, that she served at every meal, would be considered gourmet today! Happy Sunday everyone!! You can find this recipe in Dorie Greenspans cookbook “Around My French Table” or here where it was published by Epicurious. Ohhh - I've bookmarked this - what great flavors - I think I would nibble on these all day long! I thought these were yummy too. Yours look delicious! I made mine well ahead, and had great ideas of getting my post up and scheduled... nope. It was French Sunday for me too! :) So happy you enjoyed these. Nice to know that sometimes Grandma has a great idea, right? Happy French Sunday, Kathy! Your jar of olives looks very similar to mine. We picked a similar variety and used the same jar :) It's funny, growing up, I never liked olives. Later I figured out I didn't care for canned California olives from the grocery store. Once I discovered more "exotic" varieties, I fell in love. I hope you you had a great Thanksgiving holiday! I hope you had a wonderful holiday and have had a chance to rest up. French Sunday sounds perfect for a long weekend! I'm looking forward to a few more of these olives over the next week. It sounds like they'll get better and better each day. Kathy, what a lovely presentation of your Mixed Mediterranean Olives, wonderful! I knew that you would really enjoy this recipe! Have a great week! I like that you mixed different olives, it´s the best way! This is a good and easy recipe, and the oil that results is wonderful. Have a great week Kathy! Being Greek I love olives in every form! I would love to eat them on a piece of warm bread! I hope you enjoyed a wonderful Thanksgiving with your family! Kudos for even making these olives. I skipped them altogether! The olives look wonderful:) These were a favorite at our Thanksgiving Day dinner. Have a nice week. Loved the picture of your mason jar after you poured the olive oil over the olives. I salute you for making these when you were already making Thanksgiving dinner. But, they were fun and relatively simple and certainly tasty. I am one of those Midwestern girls who grew up with cans of Lindsay's black olives and green olives with pimento which came in jars. There was nothing too adventurous about eating at an Iowa kitchen table. I think your exhaustion and late Posting translates into having had a wonderful Thanksgiving, Kathy. I hope so. So nice to hear from you! I've missed you all, but am happy to get going again. Your olives look so lovely...I've truly missed out on so many great foods. We had a great Thanksgiving. Hope you and your family did too. "Talk" to you soon. I love olives--this looks sooooo good (and just in time for Christmas)! What a great idea! I love flavored olives, but I usually just by them at the olive bar at my grocery store. Time to try making them myself! I bought the olives for this, but didn't have time to make them. I hope to try them for the Christmas holidays to post later. They do look delicious.